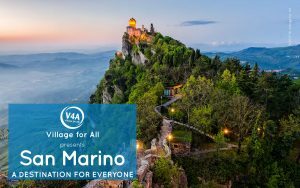 V4A Guides – Holidays for all! The Guides are product information that describes a Beautiful and Accessible Italy where extraordinary and passionate tourist facilities know how to offer Accessible Hospitality to all their Guests. Everyone wishes to follow their own desires and aspirations, and therefore we portray destinations, places, and the emotions they arouse well before accessibility. As always in our Guides, you’ll find a classification system that will allow you to understand if a given facility is adequate to meet your needs; you can access any time additional information for seniors, families, people with food allergies or disabilities (motor, visual, auditory, cognitive, relational, etc.). From high mountains to green hills and to warm beaches. Many solutions are proposed for lovers of outdoor holidays or for those who appreciate all the comforts of a 5-star hotel, without forgetting farmhouses and B&B. Whether you love the sea, the mountains, lakes, sports, culture or nature reserves, in our guides you’ll find the best that Italy, Croatia and San Marino have to offer, with over 70 destinations to choose from. You’re just a click away from everything about Accessible Tourism! I link sono per visualizzare, poi è necessario scaricare il file se vuoi averlo anche offline. Questo è valido per tutti i PDF. Utilizziamo i cookie, anche di terze parti, per assicurarti la migliore esperienza nel sito e per inviarti messaggi promozionali personalizzati. Prosegui nella navigazione accosentendo all'utilizzo dei cookie.